The original group of moms each had a young man serving in the military. Their primary purpose was to support each other during their sons’ and daughter’s deployments and to provide care packages to our young men and women overseas. Since 2002 most of the original moms have moved on as their children have, however the mission continues as new members continue to get involved and assist in growing the organization to new levels. Our strength, purpose, and commitment is dedicated to the memory of USN Combat Corpsman Dustin “Tex” Burnett KIA Afghanistan 2008; USN Master-at-Arms 2nd Class Michael Monsoor KIA Iraq 2006 (Medal of Honor recipient); and USMC Cpl. David Frizelle Decorated Marine Veteran (deceased) OEF/OIF (2001-2003) …And to all those who have made the ultimate sacrifice. We honor all men and women of past, present, and future military service who have, and continue to protect our freedom in this great nation. 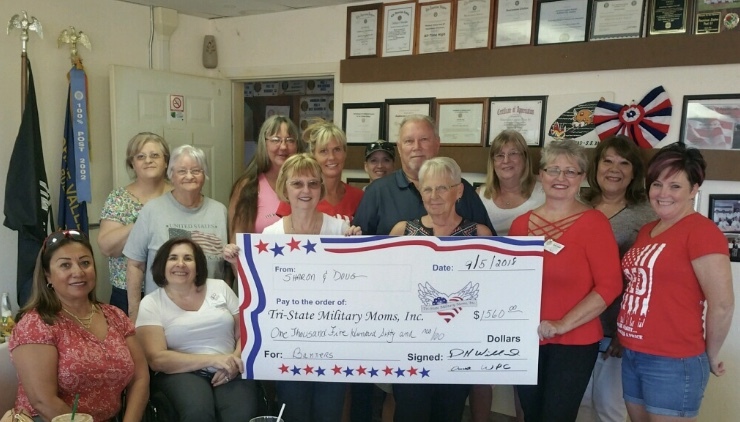 Shortly after 9/11 the Tri-State Military Moms was founded by a small group of local moms from Needles, CA, Bullhead City, AZ, and Laughlin, NV to help support our troops!!! We send 50-60 packages to our troops every other month, organize welcome home and deployment events for our local military men and women. We participate in community events and fundraising activities to support projects and to bring an awareness to the community of the need to recognize our military for the ongoing sacrifices that they make for our freedom. The original group of moms each had a young man serving in the military. Their primary purpose was to support each other during their sons’ deployments and to provide care packages to our young men and women overseas. Since 2002 most of the original moms have moved on as their children have, however the mission continues as new members continue to get involved and assist in growing the organization to new levels. We have monthly meetings on the 1st Wednesday of the month, at Noon , at the VFW Post located at 1611 E Marble Canyon Dr., Bullhead City Arizona, alternating with an evening meeting at various locations. Food and beverages may be purchased at the Post , or you may bring a sack lunch if desired. No outside beverages are allowed.